Communication is Key to Improving Relationships with Culturally Diverse Students and Families. Since 1983, the Harvard Family Research Project has helped to develop and evaluate strategies to promote the wellbeing of children, youth, families and their communities. One component of their complementary learning research focusses on family and community involvement in education in the form of FINE: Family Involvement Network of Educators; a network of people interested in promoting strong partnerships between schools, families and communities. An important question that the network have discussed as part of their ongoing research is how to better prepare teachers to work with culturally diverse students and their families and the skills that educators need to develop to do this successfully. 3. Through email, mail, or student delivery, send a positive message via audio or audio/visual medium regarding each student. Eileen Kugler, a speaker and trainer on building community support for diverse schools, further reinforces Hughes’ advice to teachers to build relationships with families using positive information and states that they also ‘need to identify nonthreatening opportunities to welcome parents with diverse backgrounds to the school. At the end of a unit of study, teachers can invite parents into the classroom so the students can share their achievements with them. As opposed to the stereotype of not caring, parents frequently feel left out, just waiting to be asked to be involved.’ Communication is therefore essential for teachers, including planning and using opportunities to engage positively with families. Although teachers are deemed as being exceptional communicators when it comes to delivering information to their students, it can be a different story when it comes to delivering information to parents and carers. According to Bonnie Rockafellow, the Education Consultant for the Michigan Department of Education, teacher education needs to include more interpersonal communication skill building to ensure that teachers are able to effectively build rapport and share meaning with families. 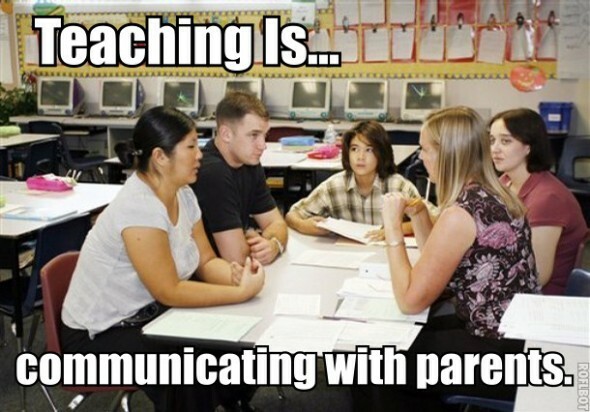 This is most evident in parent-teacher conferences, an opportunity for teachers to communicate and engage face to face with families. Rockafellow videotaped several parent-teacher conferences and through her analysis of the interactions she concluded that in each conference a ‘ritual played out. Most often the teacher presented the information she had prepared and at the end of the timeframe the teacher would ask if the parents had any questions, and then close the conference. The result of the conference was most often a reporting of the school’s information rather than an opportunity for teachers to meaningfully engage with families and listen to their suggestions and comments.’ She ultimately identifies a key opportunity for teachers to engage with families with meaning. The FINE research and evaluation of strategies for improving the preparation of teachers to work with culturally diverse students and their families is vast and resourceful; identifying opportunities for teachers to examine their own attitudes and connect with those who ‘think and look differently’ than they do.